We love Doctor Who books, as you probably know from us talking about many of them on the podcast. A new one popped up recently which took our interest, offering something slightly different, a guide to the planets from the worlds of the Doctor. Whoniverse (it’s full title being Whoniverse: An Unofficial Planet-By-Planet Guide to the Worlds of the Doctor from Gallifrey to Skaro, yes a bit of a mouthful) is a one of those large hard back books absolutely crammed packed full of information. There’s no story pertaining to one particular Doctor here, it’s all reference and facts. Bearing in mind this is an unofficial guide, it certainly doesn’t feel like it and after reading just the first few pages it’s clear author Lance Parkin has put a lot of effort into getting his information correct. What’s interesting is the non-commitment from Parkin to use only the TV show as reference. 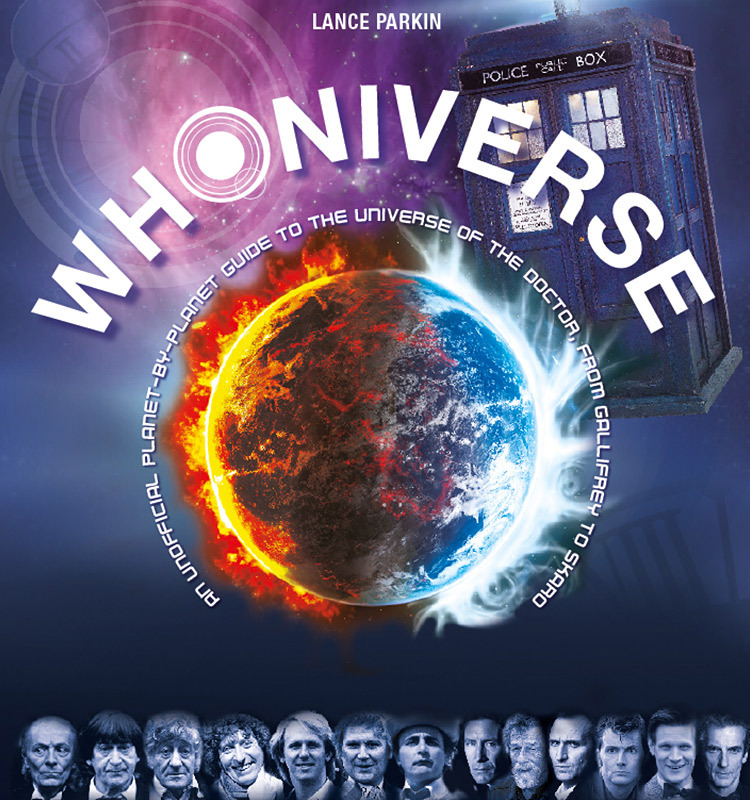 It’s noted upfront that the Whoniverse is such a diverse and often complicated world, at fault mainly from the many writers and creators over the years and their blurred lines where it concerns canon material, that it doesn’t aim to catalogue and explain every single planet and destination the Doctor has visited. More so, it concentrates on the popular home worlds of the many famous monsters and alien races (including Earth!) from Who. This isn’t a detriment to the book’s offering, if anything it’s a steer in a positive direction to keep the sheer volume of information on hand under control and cohesive for the reader. The book opens with quite a broad overview of the Big Bang, the universe along with parallel universes, pocket universes, e-space etc, and then funnels down to more specific planets and alien races. It would have been a mind-boggling fusion of confusion if every single reference mentioned in all of Who tried to make an appearance here, even for die-hard Who fans. It’s a good thing then that Parkin looked to sources such as comic books and trading cards etc but doesn’t goo “too deep”. There’s A LOT of content on offer here. Most of the pages are laid out in double page spreads which has an overview page of information along with some illustrations on the left page and on the right page a time line showing little nuggets of data relating to a timestamp for a particular Doctor or TV appearance etc. This structure provides a common layout which makes things easier to read as you get through the book. As there’s so much on offer it can seem a bit daunting the prospect of reading everything or cover-to-cover which I’m sure a lot of fans will. Having these familiar layouts makes gives you mental muscle memory as you progress through. Aside from the Timeline pages, the rest of the content is laid out with great illustrations and photos. As there’s a lot of pages we get treated to plenty of varied artwork, ranging from classic looking retro pieces through to modern comic book type art. A couple of personal favourites being the 10th Doctor and Donna artwork on page 146 and the more comic-booky Dalek illustration on page 125. There’s some decent photos on show too. The full page classic Cybermen on page 54 is a treat along with the full page 5th Doctor Peter Davison pic on page 87, not a usual picture you see in promo’s. Couple this with the little graphical includes like the solar system backgrounds, the various icons and the photos and it makes the read a lot more engaging. Each section of the book feels like you’ve just entered a new library. Although I’ve spoken about the familiarity of the pages you almost forget it as you dive into each section. For example Chapter 2 The Solar System feels like it’s laid the ground work then when you get to sections like Dalek Planets in Chapter 4 Planets of Origin you’re ready to take on all that information. Overall I’m glad I was sent this book for review. There are so many unofficial books out there that unfortunately, I’m afraid to say it, a sizeable portion of them aren’t that great. Whoniverse definitely doesn’t fall into this category and this is due largely to the wealth of information within every page. This is the type of book that you’ll definitely read in stages, going through each part of the Whoniverse or race of alien at a time, soaking all the information up. There’s something new to learn on every page for even the most knowledgeable of Who fans. That’s not to say this book is perfect. There are times when you feel the layout design looks a bit dated, maybe a bit rushed? The cover looks a bit sloppy too; the font could be nicer, the planet isn’t aligned to the middle within the text and the row of Doctors at the bottom looks a bit “son, you know Photoshop, could you mock this up at school?”. These are subjective of course and certainly not anything that should stop you buying the book, it just feels like the design and layout could have been tidied up and spent more time on. The amount of information alone is worth the price and to be honest once you’re a few pages in the design becomes familiar and easily digestible so it’s a win from that perspective. This is a recommended book for sure and one that will definitely make a great Christmas present for any Doctor Who geek.